Rhyming and Gross Motor Skills! Wow! Rhyming can be so difficult for kindergarten learners! 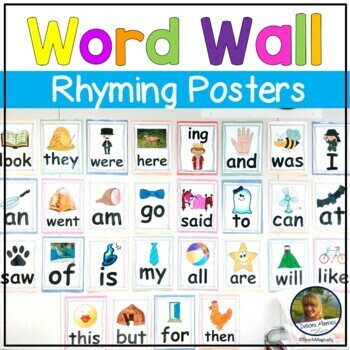 We read many books this week that focus on rhyming words. Students played "ODD EGG OUT" to practice. 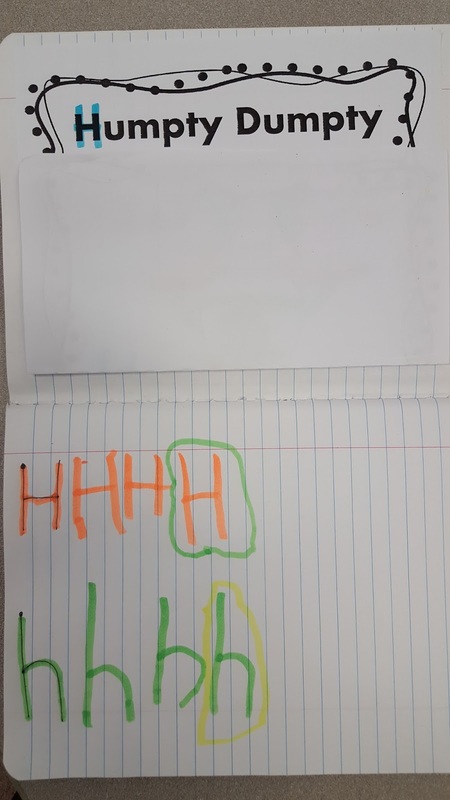 Three cards are put side by side and the student had to pick the word that did not rhyme! Throwing a bean bag to the odd egg was so much fun! Each student had 3 tries to land on the correct egg! This great game is in my Odd Egg Out Common Core Game! 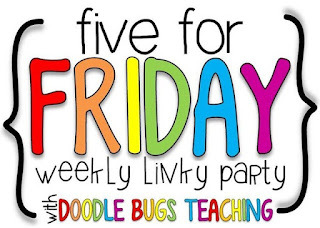 There is a recording sheet for the students to color if they decide to play at center time! 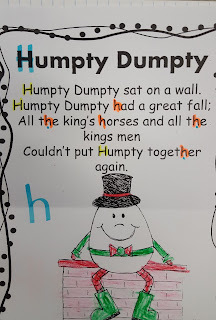 We focused on the letter Hh to go with our poem Humpty Dumpty! 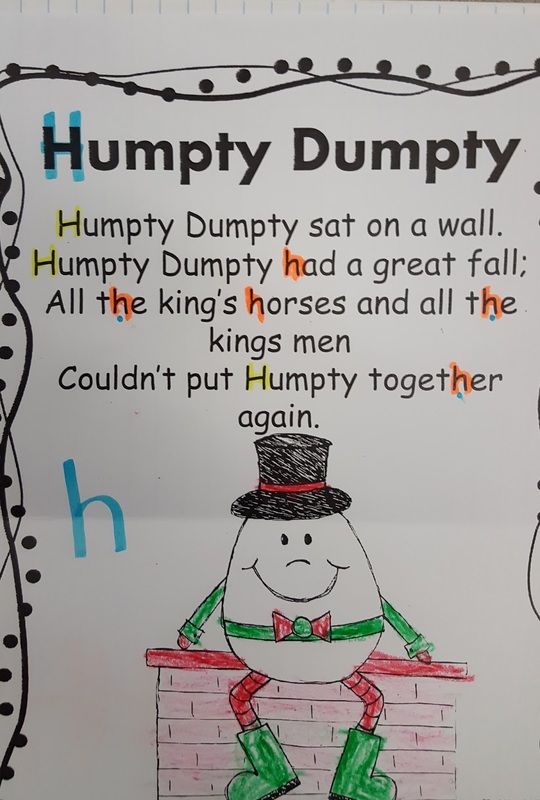 This poem is found in my Humpty Dumpty Easy Prep (click here for a link) packet that focuses on phonological awareness skills. 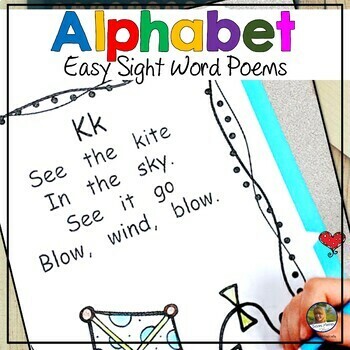 We have made many activities that go with this great poem! We looked for capital and lower case letters in the poem. We practiced using highlighters correctly. 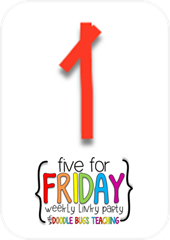 (The cap must CLICK on and then the highlighter is place at the top of the page to show that work is finished.) These details are very important to help lessons proceed smoothly in the future. 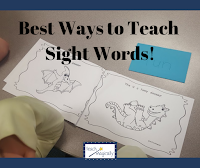 Looking closely at words is an extremely important skill for beginning readers. 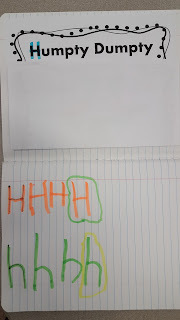 We then wrote H in the air, traced it on the paper, and made 3 original H letters. Circling the H that was best was the most fun! 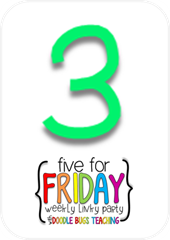 Working with fine motor skills is so important and should not be forgotten in kindergarten! Check out the cool Humpty Dumpty craft idea! We have started using our Learner's Notebook! 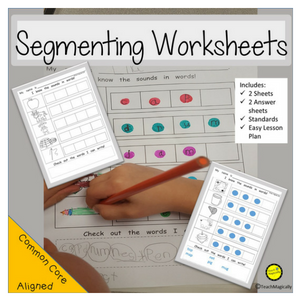 It is a book for the students to record and work on different tasks. 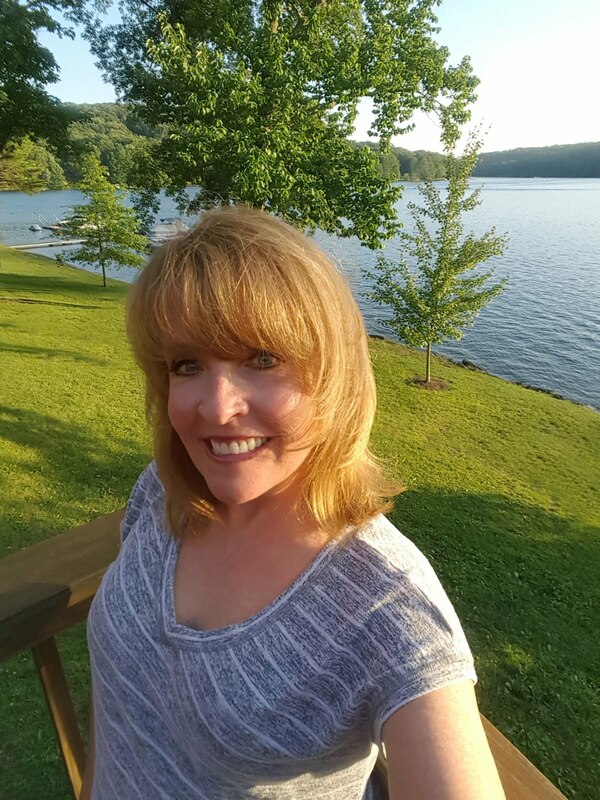 I becomes a portfolio to show learning and growth! I love the cover that I made! 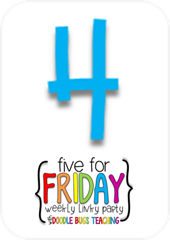 You can download it for free on my TPT site (click on the picture)! Please leave a comment and follow my store if you download! The students were so excited to get an individual book! You can see a picture of the family! I love how the mother's arms still come out of the head. It will be so informative at the end of the year to see the difference in drawings! 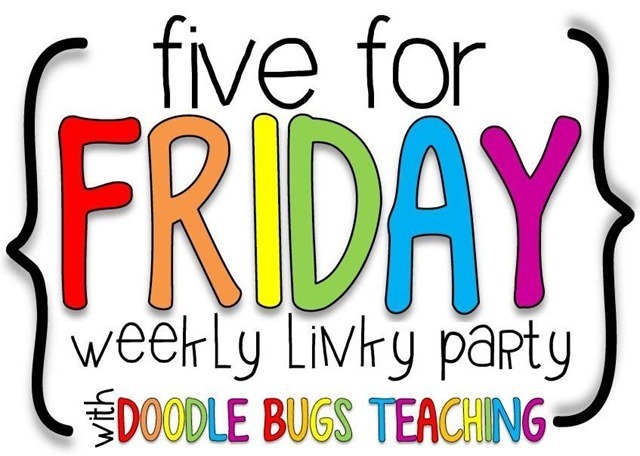 Great video to practice letters and to get those bodies moving! 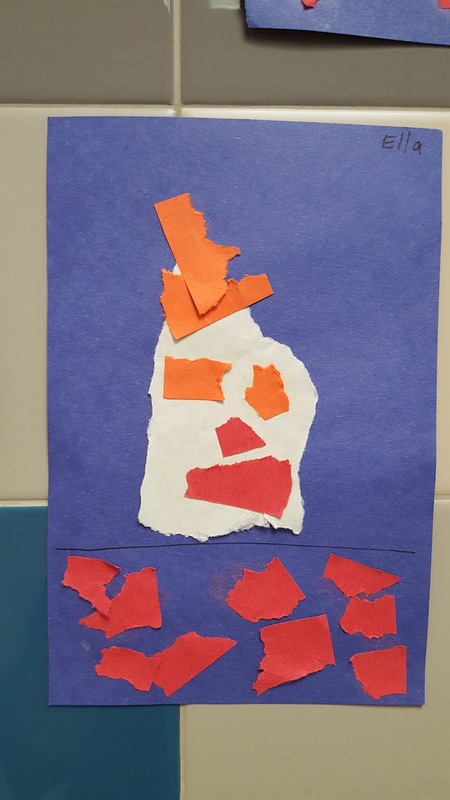 Love the Humpty Dumpty art!